Farmer Oak smiled, the corners of his mouth spread till they were within an unimportant distance of his ears, his eyes were reduced to chinks, and diverging wrinkles appeared round them, extending upon his countenance like the rays in a rudimentary sketch of the rising sun. It is hard for a woman to define her feelings in language which is chiefly made by men to express theirs. "Well, what I mean is that I shouldn't mind being a bride at a wedding, if I could be one without having a husband." She was of the stuff of which great men's mothers are made. She was indispensable to high generation, hated at tea parties, feared in shops, and loved at crises. "But since 'tis as 'tis why, it might have been worse, and I feel my thanks accordingly." 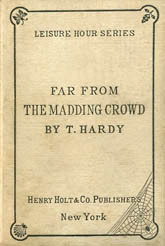 Far from the Madding Crowd was Hardy's first great novel and the one that first made his reputation. It also might be the only real crowd-pleaser among his great works. For it not only has tragedy, intrigue, betrayal, obsession, suffering, and a cruelly twisting narrative—all features of Hardy's realistic art—but a love story that wins out in the end. Plus delightful rustic characters in a jolly, rich pastoral setting that no longer exists, if it ever did. This is also the first Hardy work to explicitly take place in the Wessex region, an area his writings made famous—despite the fact there is no such place. Wessex is a name Hardy revived from the Middle Ages, once describing a kingdom that grew out of its southwest corner of the land to rule much of England but eventually was subsumed into union with other English kingdoms and disappeared as an entity. In his stories Hardy filled the Wessex region across its original corner of England with nineteenth-century counties, cities, towns, villages and bodies of water, often based on real places but with fictional names and inhabitants. And most importantly, he filled it with memorable rural and smalltown characters who lived and worked as people actually did in his time. He made serious studies of the daily lives of the kinds of folks he wrote about to get it right. The early novel Far From the Madding Crowd is perhaps less accurate, presenting the rural life more idealistically, than some of his later works like Tess of the D'Urbervilles when he has gained a more complete understanding. But even at this point he knows how the clash of human emotions can turn the idyllic into the tragic. The main story of Far from the Madding Crowd is that a young woman, Bathsheba Everdene, has inherited a farm and is courted by three men: Gabriel Oak, a shepherd who is devoted to her but is ruled out as a suitor due to his low station; Boldwood, a neighbouring farmer; and Sergeant Troy, a dashing soldier. Like Dorothea in Middlemarch, published just a couple of years earlier, Bathsheba is a strong, intelligent woman who makes a poor choice of mate. But while intellectual Dorothea's choice condemns her to years of tedium until she finds the right mate, farmer Bathsheba's choice sets into motion several years of serious repercussions, including bloodshed. This may make Far from the Madding Crowd sound like a rural melodrama but the plot, the subplots and the full characters make it so much more. I don't have much to say about this novel. It's a great, involving story about interesting people in love, hate and conflict. What else could a reader want? By the way, for the longest time I thought "madding" was like "maddening", and so I supposed the title must refer to being away from aggravating people—though some in this novel are in fact quite aggravating. But "madding" means frenzied and the title is a quote from the poem "Elegy Written in a Country Churchyard" by Thomas Gray in 1751. I'm not sure the characters in Far from the Madding Crowd are always sober, cool and noiseless. They can be a rather boisterous, passionate bunch. Maybe this is Hardy's point, an ironical one. But you do feel he loves the country and the people nonetheless, and the novel can indeed make a reader yearn for the simpler life away from ignoble strife. If only we could escape also the worst sides of our own human natures that risk wrecking paradise.